Bright Coop had its humble beginnings in 1951 when brothers Charles and N.G. Bright built their first building and started manufacturing wooden chairs that sold for $14.00 per dozen. It wasn’t long before the Bright’s were approached by a couple of local “chicken haulers” who were in need of coops to transport live chickens to market. 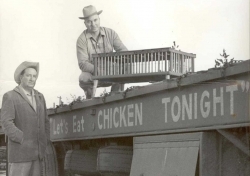 With an abundance of hardwood timber in the area and the East Texas broiler industry starting to grow, the brothers decided to go into the business of building wooden chicken coops. After approximately 30 days of hard work and the addition of one employee, they completed a “bobtail” truck load of the coops which were purchased locally by Smith and Todd Poultry. Their auspicious beginnings, with limited capital and a “fly by the seat of your pants and learn as you go” attitude, enabled them to produce a coop that was custom-engineered to suit the local market. In the early days of the company, every step of the coop production was completed by hand. As Bright Coop grew, machines designed or adapted by Walter Harris a company machinist began to automate the process ultimately increasing production to over 2000 coops per day including coops for turkeys as well as chickens. Their local market base grew to include every poultry producing state in the U.S. and parts of Mexico, which soon gained them recognition as being the largest manufacturer of wood coops. In the early 1960’s, the Bright brothers began to see a need for a better way of loading and hauling turkeys since the loading was labor intensive and the birds were being grown to yield heavier weights. Thus, turkey coops were designed to be permanently attached to the trailers and were constructed of metal frames with wood doors and partitions. 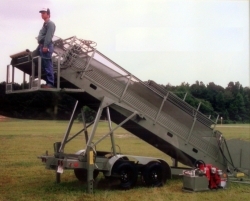 A “Turkey Harvester” was also developed to convey the turkeys from the house floor to inside the coops. This innovative product proved itself almost immediately in the industry and is still the “machine of choice” today. As the 1970’s arrived, so did the plastic coop causing the wooden chicken and turkey coops to lose their popularity. The plastic coop was lighter and easier to wash which increased its popularity. The gradual decrease in demand for the wooden coops prompted the “Bright boys,” as they were locally called, to diversify into building wooden pallets and crates. The bulk of the pallets produced were sold mostly in Texas and Louisiana and at a profit margin that was disappointing at times. In 1989, the pallet company was sold and Charles Bright became 100% owner of the company. With wood no longer a part of the business, the story doesn’t stop. Bright Coop had always sold trailers in the poultry industry as a dealer, but there was never a question when an opportunity came up in 1992 to purchase a small trailer company in Lufkin, Texas called “Viking Trailers.” Viking Trailers only produced a folding pole trailer for the forestry industry until Bright Coop purchased the company and relocated it to Nacogdoches, Texas. It was soon expanded and a complete line of forestry trailers, poultry trailers and specialized trailers were being produced. This growth prompted a new company to be formed. Today, Viking Specialized Trailers employs approximately 100 people and occupies approximately 100,000 square feet of manufacturing space. 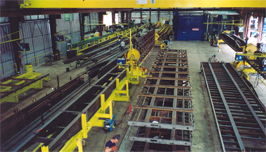 The trailer facility utilizes state of the art cutting, welding and painting processes allowing it to produce trailers that are “second to none” and are marketed worldwide. Also included in Bright Coop’s manufacturing processes is a rough terrain forklift manufacturing plant. Bright started manufacturing its own line of forklifts designed specifically for the poultry industry in 2004 after many years of distributing the K.D. Manitou brand. 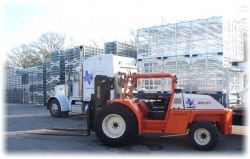 Bright Coop’s years of experience and knowledge of the poultry industry has enabled them to succeed in producing both 3-wheel and 4-wheel forklifts that are recognized both nationally and internationally as the “preferred” lifts in the poultry industry. Bright Coop continues to work diligently on new ideas and concepts that will improve the way “live poultry” is handled. 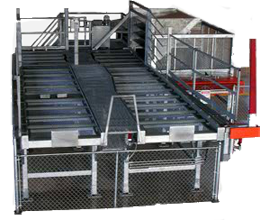 One of the more recent developments includes the CMC Automated Chicken Harvester for loading chickens by machine rather than the traditional and labor intensive “hand catching” method. The concept of gas stunning poultry in lieu of electrical stunning has led Bright Coop into developing cages suitable for this concept. Animal welfare has always been highly regarded by Bright Coop, and we will continue that tradition as we develop new products for the future.